Been wanting to buy a new cleaner for outdoor use? The best 3500 psi pressure washer is the perfect match for you. Find out where you can use it and the best pick! Since the day I discovered pressure washers, I always opted to stick to the medium-duty category as I found the cleaners from this group more suitable for homeowners like me. However, I did recommend some powerful and heavy-duty pressure washers for those looking for cleaners for commercial uses. The bases of my reviews? Well, I did a lot of research, consulted friends and family who have tried using a high-pressure gas cleaner, and I may have rented a few of those popular models from famous pressure washer brands before. But today, I’m gonna share to you a new power washer category that I won’t regret vouching for. Just last month I finally decided to buy a new pressure washer, particularly the 3500 PSI pressure washer. This time, I intend to use the cleaner for outdoor and gardening purposes only. So, for this article, I’ll discuss the things that 3500 PSI pressure cleaner can help you with. Plus, I’ll list down some of the top choices. 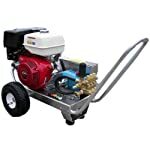 There are a lot of great brands that offer pressure washers with 3500 psi level. Take A Look At The Table Below For A Quick Run Through Of The Recommended Cleaners! Where Can I Use 3500 PSI Power Washer? Sometimes, the problem is not whether you have a good power washer or not. It could also be that you are using a great cleaner but for the wrong cleaning tasks. In addition, upon thorough research, 3000-35000 psi pressure washers are actually more in demand because people find that they have more choices in this category than any other psi levels combined. If you’re going to take a quick search on Google, then you’d know that most experts suggest getting a power washer with at least a pressure rating of at least 3000 psi. This is when 35000 psi cleaner comes in handy. The slightly higher pressure ensures that you get to remove all molds and mildew that may be lurking in the pores of the concrete flooring. Sometimes, when the molds are already blackened, they’re difficult to get rid of. The high pressure of the cleaner helps push the water into the concrete pores, thus destroying, molds and mildew build-up. Moreover, you need to think of the GPM level of the washer as well. Experts recommend getting 3.0 or 4.0 GPM flow rate to get the most of your 3500 psi washer. Just like concrete driveways, bricks are also porous. This means that bricks absorb dirt and moisture easily. And dirt and mositure, when combine, can be a good environment for molds to thrive. Now, if you see greenish or yellowish spots on your brick floors or walls, then they’re already indications that the surface is under mold attack. The high pressure of the best gas pressure washer 3500 psi can help you clean the crevices of the bricks to ensure that all traces of dirt, molds, and mildew are removed. You don’t really want to manually scrub bricks, do you? I feel the same, that’s why I am grateful to finally found the right power washer for my outdoor cleaning jobs. Finally, I use my 3500 psi cleaner when cleaning my garden pathways and even concrete fountains. I don’t have a big garden, but I still find removing the moss that grows on my garden pathways a bit tiring. Why they easily grow back after a couple of days! Do you have the same sentiment? Well, 3500 psi pressure cleaner is your answered prayer. I have been using my power washer to get rid of those ugly moss on my pathways and find it very efficient. I get to complete the task fast and it takes more than a week to see another sign of moss on the pathways. Also, most 3500 psi cleaners have at least 30 feet high-pressure hose, so I can reach even the hidden spots of my garden. This is already a great improvement for me, This means I only need to clean my garden at least twice a month. Now that you know the tough outdoor cleaning tasks that you can do with a 3500 psi power washer, it’s time to get to know the best choices in the market today. In this review, I only included the gas power washers because the electric ones have a low flow rate. According to a lot of pressure washer enthusiasts, as well as experts, it’s best to pair high-pressure machine with high flow rate. Doing so will give you better cleaning results. To be completely honest, this is the model that I use at the moment, and I’ve been loving it so far. There are a lot of things to love about this 3500 psi power cleaner. This is a heavy-duty and professional power washer that is specifically designed for outdoor cleaning operations. You can tell by its steel frame construction and pneumatic tires that the machine can handle tough cleaning jobs. You can enjoy a high-pressure rating of 3500 psi and 4.0 GPM flow rate, giving you enough power to complete even the toughest jobs outdoors. It has a total cleaning power of 14,000 CUs, which is more than enough to tackle stubborn dirt and molds. Pressure Pro EB405HC is easy to start and doesn’t produce much noise when doing so. So, you don’t have to worry about your neighbors. I notice that the belt drive run of this cleaner doesn’t overheat easily. In fact, it cools pretty well. Despite its bulky look, the machine is actually easy to move around, as it has an aluminum frame type instead of heavy steel, perfect for both men and women users. The tires are great, heavy-duty and can be move easily even on bumpy terrains, just like in the gardens. The high-pressure hose that comes with this unit is 50 feet long. Also, the Cat pump is Triplex Plunger. If you read my other articles, I mentioned that Triplex plunger is the best pump type for power washers. They are durable, doesn’t overheat easily, and can last long hours of operation. The pressure of this cleaner is also adjustable. Made in the USA, so you’ll have peace of mind in terms of the product’s safety standards and power supply. This is an expensive purchase. The main reason why it took me this long to actually buy this pressure washer. But I can confidently say that it’s a worth investment. Apparently, this unit has a short warranty period. You only have 90 days for both commercial and consumer use. BE X-3513HWCATCD is a cold water 3500 psi gas power cleaner that’s been on my list together with Pressure Pro. This powerful cleaner has also caught my attention for several reasons. Firstly, it has a lot of good feedback from 3500 psi pressure washer reviews online. Secondly, the price is quite competitive. It may not be the cheapest pressure washer in town, but it surely isn’t the most expensive either. Lastly, it has amazing features like its Honda GX engine and pump type. Just like the Pressure Pro (my personal choice), this one also has a great cleaning power of 14,000 CUs. It’s a commercial grade cleaner with a reliable Honda X engine. The engine starts easily and runs quietly, which is a big plus. Being a powerful cleaner, BE made sure to use the best pump for this unit. It makes use of the triplex plunger pump. The steel frame construction is rust and corrosion resistant, making it last for a long time. The wheels are also 13-inches never-go-flat tires, perfect for outdoor cleaning. Also includes 50 feet high-pressure hose and 4 quick connect nozzle tips. As for its pressure, this one is also adjustable. I was surprised that this 3500 psi pressure washer cleaner is actually offered with 3-years warranty program, both commercial and consumer uses. The pump brand of this model is General Pump, which is not bad at all, but Cat pump (Pressure Pro’s pump type) has a lot of potentials and is actually optimized for long-life and is the most trusted name when it comes to heavy-duty pumps and systems. Also, this one has a bulkier structure as compared to Pressure Pro. Nevertheless, this one’s a good choice as well. Hotsy is a pressure washer company that already has 50 years of history in the industry. The name itself says a lot about the type of products the company specializes. Hotsy is actually a brand that specializes in hot water pressure washer. So, if you are looking for a 3500 psi power washer for hot water, then Hotsy is the brand to go for. Over time, the brand has expanded its pressure washer lines and now produces cold water pressure washer as well. 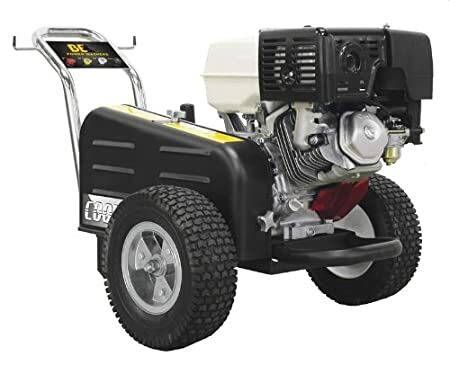 This 3500 psi cold water pressure washer is known for its affordability, strength, and durability. This cleaner is designed for continuous use in commercial applications. Has a reliable Hotsy Triplex plunger pump, which can withstand long hours of operations. This is also a commercial grade 3500 psi power cleaner that works great in outdoor cleaning. The Hotsy DA Series has a lightweight design, although the structure looks bulky. It has a corrosion-resistant aluminum frame. You can enjoy a warranty service of up to 7 years. It uses the Honda GX engine, which also has a 3-year warranty. The wire-braided 50-feet hose is consisted of durable couplers and has swivel end. The belt drive pump is protected by its thermal pump protector. So, there is minimal chance of overheating. This model has 3.5 GPM flow rate, which is a bit lower than Pressure Pro and BE 3500 psi power cleaners. If you were to follow experts advice, you need to get at least 4.0 GPM for your 3500 psi cleaner to get the most of its potential. It’s a bit more complicated to use as compared to Pressure Pro. 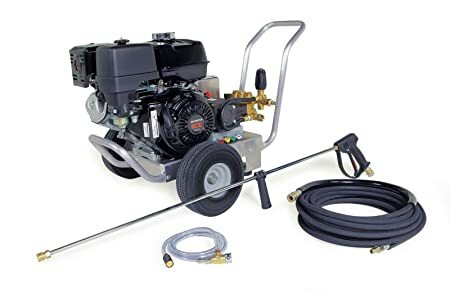 As you may have noticed, the best 3500 psi pressure washer that I personally recommend is the Pressure Pro EB4035HC Heavy-Duty 3500 Gas Pressure Washer. After a thorough consideration of the 3 best models, I think that Pressure Pro offers the most value to money. Many people have already tried using the power cleaner and majority of them are satisfied with the cleaner’s performance. The quality, durability, and the design itself are definitely worth the investment. So, there you have it! Looking for more heavy-duty pressure washer options? Click Here!